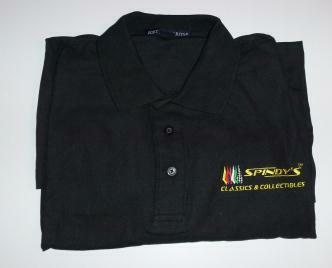 Copyright © 2011-2012 Spindy's Classics & Collectibles. All Rights Reserved. Please check out using the Shopping Cart at the bottom of this page when done with your selections. Thank you. 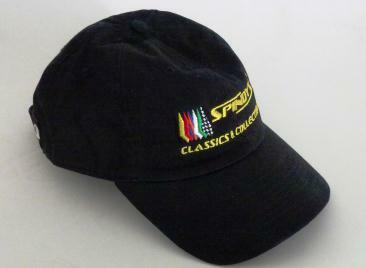 $32.00 (Black Only as shown) LG or XL in stock. Price includes shipping and all taxes. In stock items ship within 72 hours. Allow 3-4 weeks for customer orders. Custom colors and sizes available for an extra $10.00 at $42.00 per shirt. Champion Six Panel Low-profile Brushed Cotton Twill embroidered with the Spindy's logo. 100% brushed cotton twill. Enzyme-Washed. Unconstructed. Sewn eyelets. Self-fabric closure with brass snap. Currently Back ordered. Allow 2-3 weeks for delivery, up to 4 weeks for any custom orders. If you have selected a custom order, please include a note on your paypal payment on the color or sizes you need and/or email us the specifics once you have checked out. If we have questions or need clarification, we will contact you before completing your order.